March Madness ended on Monday by crowning a men’s basketball champion, but it was also crest day for the Red River in Fargo. Even though the river rose quickly, it seemed to take awhile to crest as we were watching it everyday. The 35′ crest meant sandbagging at El Zagl Public Golf Course, which was a success. Thanks to all the Fargo Park District staff that raised that dike by 2′ to keep the river flood waters out! El Zagal currently has some minor water areas, but can be pumped out and cleaned once river levels subside. They still have some snow melting to happen and drying out before the course will be able to open. 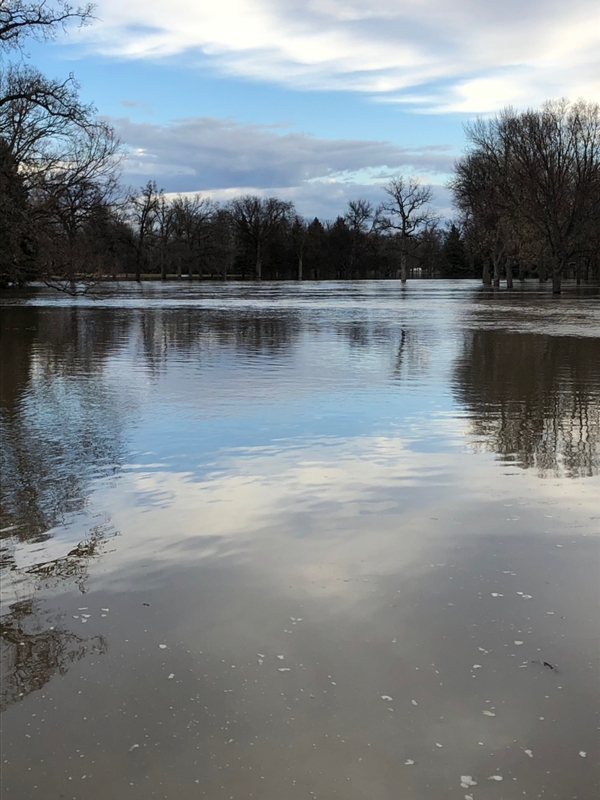 Rose Creek Public Golf Course is experiencing the river’s rise on holes 8-13 and the driving range. The driving range can be pumped out at approximately 33′, and all but 12 and 13 should be clear of water at the 30′ level. Again, they need some final snow melting, drying out and clean up before the course is able to open for play. Edgewood Public Golf Course was most vulnerable at the 35′ level. Our bowl area, holes 1, 5-9, 10, 11, and 18, go under at about 28′, but that also means when the Red River goes back to 28′, we will be able to pump that area out. When that time comes it takes about 4 days to get most of the water out of the bowl area. Every foot that the Red River goes down means much more turf gets out, both at Edgewood and Rose Creek. Our superintendents, Eric Hanson and Jason Spitzner, both have great staff and plans in place to get us ready as soon the course will allow. The Fargo Park District is fortunate enough to have 2 other courses that were not affect by the River flooding. Osgood and Prairiewood Public Golf Courses still have some snow melt and drying out to do, but should be open before the other 3 courses. Keep checking back here and our course Facebook pages for course updates!